IEEE SPS Malaysia Chapter was established in August 2002 with membership of only 25 people. It has been trying to place itself as the society that generates interest by bringing the latest information and resources to the local members through its activity. This include the flagship events such as the ICSIPA conference series and the IPIARTI and SASSP workshops, as well as workshops, seminars, DLP talks, competitions, social activities and membership drives. The membership as of January 2015 is now 120+ people.The chapter has been selected as the first recipient of the IEEE Signal Processing Society Chapter of the Year Award in the year 2011. 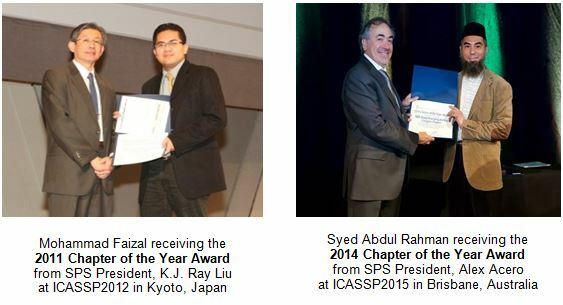 The chapter again won the IEEE Signal Processing Society Chapter of the Year Award in 2014, together with the IEEE Malaysia Section Best Chapter Award the same year.